Arbrux manufactures pond aerators from ½HP to 3 HP, therefore its important to properly size an aeration system for your specific pond. Sizing is not an exact science since ponds vary in shape, depth and water quality, all factors to take into consideration when your are choosing the size and number of aerators required to aerate your pond. 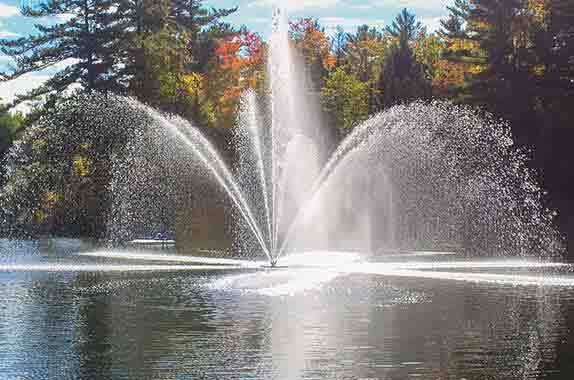 The overall shape of your pond will dictate the number of aerators needed to keep your water sufficiently aerated. Regular shapes like circles, squares or triangles can all be aerated the same way. However, as they spread out or become irregular in shape, more aerators are typically needed. For example, a circular pond would only need one aerator whereas an irregular shape would typically require more than one. The last and probably most important factor to determining the proper aeration system is the overall health and water quality of your pond or lake. A newly constructed pond will typically need less aeration than an older pond of the same size. If you have additional or specific questions on water aeration, please fill out our Contact us form or call us toll free 1-888-211-3548!